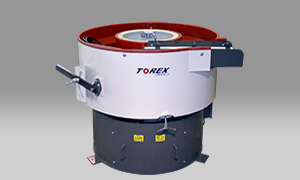 The vibratory bowl finishers are offered in two series, the NT and NTG series. 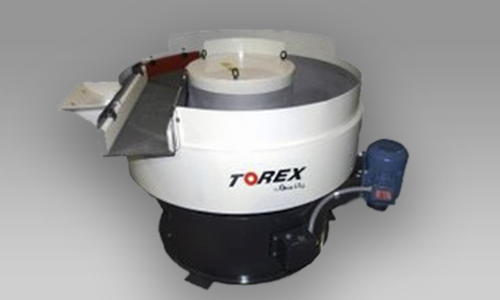 Each series can be configured as an internal separation bowl, batch finishing bowl, and the heated cob dryer bowl. 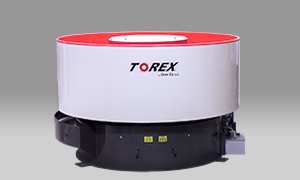 The tub series of vibratory finishers is called our GVM Series. It is a rectangular shaped process channel, as opposed to the round bowl style. 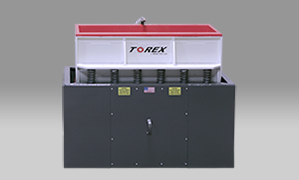 Oil Drive System: The NT Series (oil lubricated system) utilizes a drop in solid steel tube cartridge. The cartridge is mounted in the processing bowl using a tapered socket and wedge clips. It can easily be removed using normal maintenance tools. A drive shaft and roller bearings, ideally suited for vibratory shaker applications, are housed in the drive cartridge with bearing retainers and oil seals at each end. Lubrication System: The system uses a low-pressure oil pump that provides lubrication to the main shaft bearings. A dual pressure switch system monitors the oil pump and oil filter. Grease Drive System: The NTG Series (grease lubricated system) utilizes two flange mounted roller bearing units. The bearing units are mounted into the processing bowl with robust solid steel bearing webs. Lubrication System: The system uses easily accessed grease zerks, located on the exterior of the machine, to lubricate the bearings. Grease Drive System: The GVM series (grease lubricated system) utilizes two flange mounted roller bearing units. The bearing units are mounted into the processing tub with robust solid steel bearing webs. Separation of parts and media are accomplished with the internal separation system built into the processing chamber, and is controlled by a manual lever or optional pneumatic cylinder. Batch machines are usually used for larger parts that can be hand picked out of the media, or can be used with an unload door and screener to empty the entire bowl of smaller parts and media when the risk of part mixing is present. Tub machines allow for longer or odd shaped parts that often get lodged in a bowl vibe due to their radial travel pattern. Parts can be hand-picked or an optional unload door may be utilized. Has a wide channel of heavy steel construction without a urethane lining. It is mounted on a rigid, round base and suspended with heavy-duty springs. Separation of parts and media are accomplished with the internal separation system built into the processing chamber. © 2019 Sturgis Finishing, LLC - Finishing Machines, Media and Compounds.